This document shows the potential of using sea water irrigation for global development. It’s odd that while all total (active and inactive) fresh/sweet water resources only makes up 2.50 till 2.75% of earth’s water resources, our whole agricultural system is based on the use of fresh/sweet water. But it even gets more odd: only 0.01% of all global water resources can be used/accessed for for irrigation of the current fresh/sweet water crops based agriculture. So it’s quite clear that we've bet too heavily on the wrong water card in global agriculture. Why? Because there are also salt water loving crops (halophytes is their species family name). A whole family of species in nature we’ve neglected too long due the fact that we didn’t know they exist and therefore we didn’t develop the way like we did with fresh/water loving crops. We as mankind could make a major leap forward on food/water resources if we would develop these species like we did with the fresh/sweet water flora/crops. 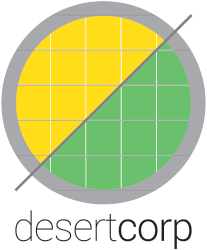 This document is about combining abundances (salt sea water, wide desert soils and huge biodiversity of crops available in salt water loving crops) and merge them into a) a global new economic cycle/century, b) a global ecologic/biodiversity revival, c) stopping almost all migration wave problems and d) eliminate almost all food/energy tensions/wars. Enter your new narrative on the 21th century by just assessing the information below. Global game changers for the better. Build on existing yet not used huge abundances. Where our model is applied, regular rainfall is returning due increase of evaporation and increase of shadows, which both change air flows and cloud formation and thereby precipitation, making fresh/sweet water based agriculture also possible again in these regions. To answer the two basic questions regarding this all directly: Question 1: Grows anything on salt water? Yes, abundantly. Just visit sea side mangrove region and you will be surprised by the both flora and fauna abundance in and by salt water. Question 2: Ok, stuff grows well on sea water, but do commercial viable crops do? Yes, very good: the best known example is salicornia (for high grade proteins and oils): salicornia out of the deserts by the use of seawater can totally replace the global rain forests destruction production of soy (for proteins and oils). George Washington was also a salicornia farmer and he did well by it. When the Sahara desert in an area of 1,500 km times 5,000 km will be greened by this market driven relative very low investment combo model of seawater/halophytes this will deliver an 7,500,000 km2 green zone in the Sahara, the impact is huge. If the Middle East and Central Asia is done too the total greened area will be far more than 12,000,000 km2: which on itself already is quite a volume. The global impact has three main facets: a) global economic, b) global ecologic and c) global food security. The global economic impact is delivered as this model will lift the poorest 1.2 billion out of poverty and deliver them an economy (with the huge impact this will have on the global economy). Each 1 million km2 done lift 100 million people out of poverty (economics for 100 people per each 1 km2). Desert greening by seawater/halophytes based economics will end poverty in the Global Middle for ever. When 12 million km2, which is only 25% (12 million km2 of the 51 million km2 actual global deserts there is) of the global desert areas will be greened with 5 farms of 5 people per farm per km2 and the surrounding economy first is 1 to 1 (200% total), growing via 1 to 2 (300% total) to 1 to 3 (400% total). This 25% of the global desert surface (global deserts are in total 33% of the global landmass, so 25% of global deserts is 8% of global landmass) than delivers 12,000,000 times 5 farms per km2 is 60,000,000 farms, times 5 people per farm times is 300,000,000 direct by farms serviced people, times 4 for the non-farm sector that initial is powered/ignited by the farm sector is an economic foundation/prosperity for 1,200,000,000 (1.2 billion) people. The overall people density ratio than is 12 million km2 for 1.2 billion (is 1,200 million) people which is 100 people per km2. The overall investment amount than is 5 times E 200,000 is E 1,000,000 per km, is E 1 invested per m2. The overall investment per local capita than is E 200,000 per 5 people farmer family, plus the 1 to 3 derivated economy, so 4 times 5 is 20, so E 10,000 per capita. The total investment? That is 60,000,000 times a desert farm investment of E 200,000 (being E 70,000 buildings/equipment/household investment per desert family farm + E 30,000 first 2 year farm costs / family income per desert family farm + E 100,000 infrastructure/facilities) = E 12,000,000,000,000 aka E 12.0 trillion. Doing another 12 million km2 (as in: an other 25% of the global deserts) will be another E 12.0 trillion. So for E 24.0 trillion investment we fix the world economic in a sustainable way in the 21st century: economic, ecologic and regarding to tensions/peace/migration. Plus we lift the poorest 2.4 billion into the global economy in a sustainable way, changing their/our lives/perspectives. As bonus we change 50% of the global deserts into sustainable wide biodiversity regions. The return? Multiple of the investment in a sustainable way. By this model is getting an E 120 trillion advanced and sustainable global GDP/economy (now somewhere south of E 80 trillion) possible. We're already somewhere at 66% right now, this is the way to realize the last 33%. So each E 1 Trillion invested gives an annual (each year recurring) contribution of E 1 Trillion to the global GDP. Giving each of the 9 billion people on earth in 2050 an average E 13,333 (due an E 120 trillion global GDP by a 9 billion people population). Of course the average household income is quite higher than the per capita income, as households mostly are made out several persons. Speaking on global GDP figures: the concept of calculating the global GDP in one region's currency (USD, EUR, RUB or CNY) is not valid (it delivers too much weight to the value of one of those). Investing by market means of 20% of the global GDP over a period of 20 years (so only 1% of global GDP by market investment per year) will deliver this. And the already existing global economy will blossoms by it and become also more sustainable too. So the wanted/needed global GDP of E 120 trillion can become a reality. In a sustainable economic, ecologic and fiscal way. It's all about making the right choices. The beauty of it all: it can be done completely market driven, so it will not burden any government with debt (governments just have to regulate it). Another beauty of it? It can be done everyhere (in any desert) on any scale (national/bilateral/multilateral or even just regional) and by everyone (it's no rocket science). Yes, it's a configuration of several very specialistic realms, but we know but we have the specialists in these realms (from finance, via realization, to output). The global ecologic impact is delivered as the desert greening model turns 50% of 1/3 of the global landmass (which are deserts: 33% of global landmass) into huge biodiversity. Delivering rain (due cooling by water presence and water evaporation) to this 50% of 33% of the global land mass driest regions. It will store tremendous amounts of CO2 organic into the soil (something the global warming movement/believers like). In the business model the carbon rights are not calculated: we see them as a fraudulent system (both in science as in operation). Who said that all green or sustainable economy lovers should be of the Al Gore religion? The global food security impact is due the supply of such a productive volume will deliver global food security for ever, certainly as storage, grading and export facilities are integrated. The food output of such an area based on the intensive combined/integrated saltwater driven agriculture, salt water driven aquaculture and livestock is huge. Malthus his black views can be archived for ever. They already have been proven wrong since he invented them: they ignored the positive effects of both trade systems and human intellect driven innovation. So finally the Malthusian vision will be become a fossil of the past: obsolete for ever, even in energy terms (as the model is renewable energy based and energy positive: more clean power export than hydrocarbon import). Malthusians need just to increase their Prozac intake, their dark views will not have any scientific foundation. Desert greening will not lead to overpopulation of the world (as the world population will peak at 9 billion in 2050 and then sharply will age and decline due low birth rates: the Japan syndrome).